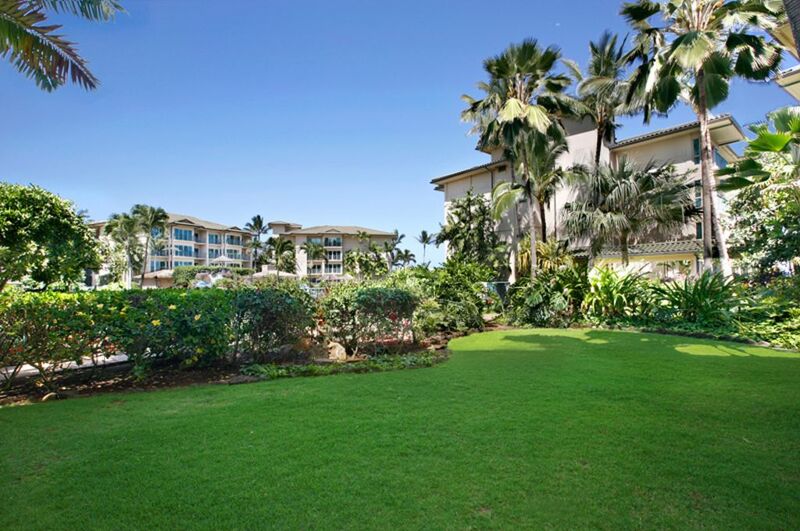 A tropical garden delight, this ground-floor 2 bedroom suite opens up to beautiful landscaping and lush green lawns. Stroll to the beach right from your room or take just a few steps to the infamous resort paradise pool. Featuring a king bed, queen bed and a queen sleeper sofa, this suite can comfortably accommodate 6 people. The stylish interior includes a stately kitchen with a Wolf glass cooktop & oven, Sub-Zero refrigerator, GE profile microwave, Fisher Paykel dual dishwasher drawers, granite counter tops, African Mahogany cabinets, three full bathrooms with Peruvian Travertine stone surrounds and soaking tubs. Enjoy the clean design and convenient location, with the beach and boundless Kauai adventures just beyond your private lanai. Two acre; swimming pool with water features and waterslides. Very nice condo well appointed. Dedicated wireless not available. Used resort system. Dryer did not work. Online reservation system way too complex. We really enjoyed the resort with all its amenities. Grocery store was just around the corner. Pool was great, hot tubs were wonderful. BBQ was awesome. We had such a good time staying here. It has a beautiful pool with slides and hot tubs. It's in a great location. It was clean and had everything you need. We would come back. All was great except the following info I passed on to the gentleman that called regarding check out... the iron was dirty and left a mark on a shirt we attempted to iron, there were only hand towels in one of the bathrooms and they were a bit disheveled (we found extras in the other bathroom), and what I forgot to tell him was that the floor had sand or little pebbles here and there as we took off our shoes while inside. Please know that these did not affect our stay. It's just explaining what I would do if it were my place.